What does it mean to have an ADA sign? As a new business owner, the first sign you think about buying is the one for the front of your business. But there are laws in place that mandate other interior and exterior signage. ADA signs are required for most businesses and organizations so it is important to find out if your brick and mortar is subject to these laws. ADA stands for Americans with Disabilities Act which was enacted in the early 1990’s. The law intends to ensure that access to goods and services are universally available across every demographic. Most of the time this means that universal symbols and/or braille must be present on the sign. Do all signs need to be compliant with ADA standards? Nope! Lots of signs are considered exempt from ADA codes. Business addresses, building directories, company names and logos, menus, name plates, seat and row designations in assembly areas, signs in parking facilities (with the exception of accessible parking space signs), temporary signs, and signs not located in public use areas are all able to work around the ADA codes. Overhead signs do not require braille. What signs must be ADA compliant? 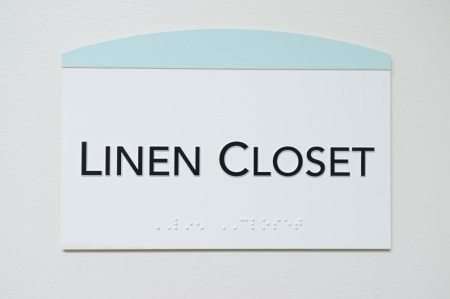 Every permanent room and space is required to have an ADA compliant sign that provides its identification. Safety signs marking exits and stairwells are also required to be ADA compliant. All hotels, hospitals, schools, nursing homes, residential buildings, offices, and government complexes should have fully ADA compliant signs. What are the specifications for ADA signs? All ADA signs are required to have non-glare backgrounds and characters with the exception of parking and traffic signs. High dark/light contrast between characters and their backgrounds are required. The type should be easy to read. The laws become more specific based upon the type of signage. Your best option is to inquire to a professional ADA compliant sign company with specific questions pertaining to your case. For advice on which ADA signs are required for your building, contact Signarama Colorado. We’ve worked extensively with ADA signage and are familiar with state and local laws.